There’s certainly randomness when it comes to clutch time in the NBA, as the Thunder saw on Monday night when Russell Westbrook drew a late foul in the lane, and on the flipside when Andrew Wiggins banked in a three at the buzzer earlier this season. But for the Thunder over the past seven wins, all of which have been two possession victories, there’s been some method to the late game madness. The Thunder’s defense in the clutch has been much, much better than it was at the beginning of the season, and that has made all the difference. At practice on Tuesday as the team prepares for its upcoming matchup with the Utah Jazz, Head Coach Billy Donovan explained that his team’s understanding of the defensive calls and when to implement them has improved over the course of the first 30 games. Not only do Thunder defenders need to call out coverages or switches at the right time, those calls also have to be the correct ones based on the other team’s personnel. A major defensive catalyst for the Thunder has been one of its All-Defensive team performers over the years in George. Over the past four games, George has 11 steals and he has 15 games this season with three or more steals. In addition to his clutch, game-sealing steal in Indiana to beat the Pacers, George had two steals and a block to stymie the Denver Nuggets on Monday in the Thunder’s 95-94 win. “He uses his hands really well to deflect balls. He’s a good anticipator,” Donovan said of George, who leads the league with 69 steals this season. “Just his length and his talent defensively — and the other thing too is I think he’s got a real defensive mindset. I think that’s where he really prides himself. In addition to being disruptive and calling out coverages accurately and promptly, the Thunder must be aware of the Jazz’s strengths and weaknesses both on the perimeter and in the paint. Although Rudy Gobert will be out, Utah still has veterans in Ricky Rubio, Joe Johnson and Joe Ingles that can generate high percentage looks for the group. Donovan Mitchell has been the dynamic game-changer for Utah, ranking in the top five amongst rookies in points, field goal percentage, three-point percentage and steals. - The Thunder doesn’t have an update as of yet on Steven Adams as he recovers from the concussion he sustained in Philadelphia. After missing the past two games, Adams did not participate in all of practice on Tuesday, but was seen doing some individual work afterwards. Check back to okcthunder.com for more information on Wednesday afternoon. - Russell Westbrook has now scored 25-or-more points in three straight games, and shot 50 percent for the Thunder against the New York Knicks and 16-for-28 (57.1 percent) against the Nuggets. Finding his shooting stroke could be huge not just for Westbrook but for the Thunder, and the point guard has a favorable matchup against Utah. Westbrook has four triple-doubles in his last five games against the Jazz, and is averaging 30.8 points, 11.6 rebounds and 11.4 assists against the division foe. 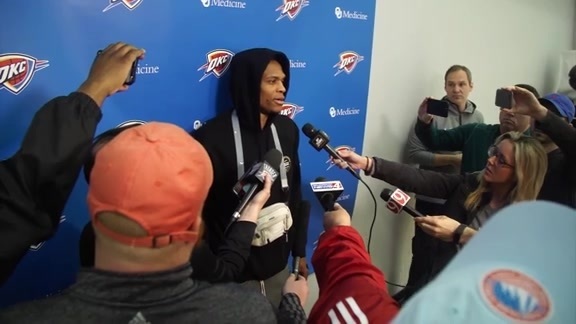 - It was a funny scene at practice on Tuesday as far across the courts at the INTEGRIS Thunder Development Center, it appeared as though Andre Roberson was wearing a red bandana of some sort. It was actually a headband, and attached to that band was a rubber ball attached to a string. It was a brand new hand-eye coordination tool that a Thunder strength coach brought to practice. Jerami Grant and Roberson were the first on the team to use it, trying to keep their hands quick to catch those laser passes from Westbrook. - In addition to working on his hands, Roberson has been clearly showing signs of a more attack-focused role on the offensive end. His game-winning layup against the 76ers on Friday was a sign of his recognition that if he can put pressure on the defense, it can positive impact the game. On Monday he did well by cutting under the rim for easy baskets, but most impressive were his drives into the paint, where he gashed the defense and created scoring chances.